African dictator, HITLER Muhammadu Buhari, who is current Nigerian President, has killed again. This time around he killed nothing less than 20 peaceful Biafran protesters in Aba, the Abia State business hub. The killing was done on Tuesday February 19, when Biafrans converged at National High School, to pray before their mega protest to be held that day. A worldwide mega protest was ordered by the leadership of the Biafra nation against the illegal abduction and detention of their leader, Nnamdi Kanu. And as had become customary with the Biafrans in Aba, they started to pray before the protest. Just as they started praise-songs, a band of well-kitted Nigerian Policemen descended on the arena in 15 trucks. In less than no time, they were joined by Army personnel who came in five trucks. The people ignored and continued with praise and solidarity songs. They knew they were engaged in a legitimate aspiration and did not need to fear the Police or Army. Part of their songs was: “My brother, don’t you worry; my sister, don’t you worry. If I happen to die in the battle-field, never mind, we shall meet again”. Few minutes later, the Police and Army opened fire on them and kill many. In fact, about two days later when the people took count, up to 31 people were missing. Out of the 31 that were missing, 20 were later confirmed dead as their bodies were discovered. Scores were wounded; twenty were arrested and detained by the Police. 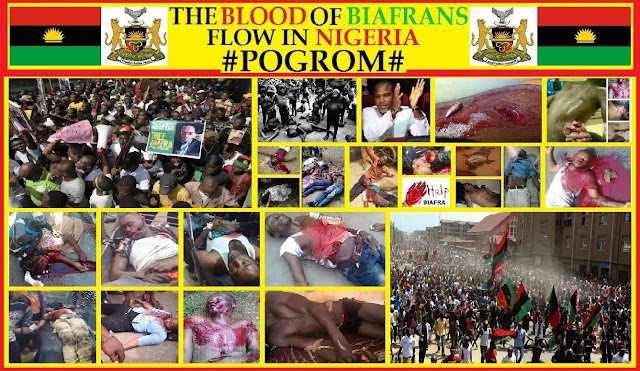 Last month, Monday, January 18, 2015, Buhari’s men murdered nothing less than five Biafrans, including a school girl of about seven years old. In fact, Buhari’s murders of Biafrans (apart from the atrocities he committed during Biafra/Nigeria 1967 – 1970 Biafra/Nigeria war) started in June, 2015, which was about 20 days after he was sworn in as Nigeria’s President. Sooner had he taken his oath of office, that he went gaggers, sending sent his goons to bomb villages in Cross River and Akwa Ibom States. His claim was that he was chasing smugglers. But Biafrans knew the bombings had nothing to do with smugglers, but an indirect message to them – a show of force – that they should desist from Biafra agitation or face his wrath. Since then, Buhari and his goons have made the massacre of Biafrans a game. From May 29, 2015, when he was sworn in as President and up till today, nothing less than 1000 Biafrans have been killed (or disappeared) by Buhari and his goons. For instance, on August 31, 2015, after a successful meeting of IPOB Biafrans at Onitsha, Anambra State, the people decided to evangelize the city, to convince the people on the good news of Biafra. But a combined team of Buhari’s Police and Navy ambushed them, shot and killed five people; injuring many. Four months later, on December 2, 2015, at the same Onitsha, Anambra State, a young undergraduate lady, Nkiruka Anthonia Ikeanyionwu, from Adazi Nnukwu in Anambra State, was killed among other people by Buhari’s men. Several others were also injured. The young lady of about 19 years old was a student of Federal College of Education, Umunze. At Igweocha (Port Harcourt) five people, who were also on the same protest for the release of Kanu, as well as for the Independence of Biafra, were murdered as Police and Army opened fire on them. This particular killing took place on Tuesday, November 10, 2015. Apart from those killed during protests, there were also others abducted from their homes in the dead of night and secretly killed by the Police, Army or Navy, who bury them secretly in mass graves or dump them in rivers like Niger. Meanwhile, this devil’s reincarnate, Buhari, is the same man that some characters, who call themselves African leaders, were trying to shield from prosecution by threatening to exit from International Criminal Court (ICC), where Biafrans had dragged him to. They claimed the ICC was an instrument of European intimidation and humiliation of Africans, and as such they must opt out. This is in spite of the fact that Buhari’s atrocities against Biafrans, since he was rigged into power as Nigerian President, are in the public domain. This is also in spite of the fact that Buhari atrocious part in the Biafra mass murder and genocide of 1966 – 70 were not hidden. Aside being at the centre of the 66 pogrom against Biafrans, Buhari was with Murtala Mohammed, the butcher that robbed the Central Bank in Benin (in the now Edo State) during the war. He was with Murtala Mohammed when the Asaba massacre of hundreds of innocent Biafrans took place. As a result of his antecedents, it was no surprise to a lot of people when, before the 2015 election, he boasted: “Igbos hated me because of my involvement in Biafra war (Igbos are Biafrans). If I have another opportunity, I will kill them to keep Nigeria one”. Buhari believed the opportunity had come when Biafrans, through Nnamdi Kanu’s agitation, upped the tempo of their activities to restore Biafra. But Buhari did not find it funny that Biafrans were protesting his illegal arrest and detention of the Biafran leader, Nnamdi Kanu, neither did he consider the fact that Biafrans were acting within the law. His instant response was to release his killer squads to massacre the people. Painfully for Biafrans, it is this atrocious Buhari that some so-called African leaders were trying to shield from prosecution as Biafrans dragged him to the ICC. It did not matter to them that Buhari was killing their fellow Africans, who had broken no law in their self-determination activities. After all, that is the full essence of the Indigenous Peoples Rights Charter of the United Nations Organisation (UNO), enacted in 2006. The questions then could be: Would those so-called African leaders say that they did not know that it was this same demand that Scottish people made and nobody abducted their leaders or killed their people. Was it not this same demand that motivated the British government to organize a referendum for the Scots, to determine if their demand for exit from Britain had majority backing? Was it not this same demand that the Quebec people in Canada have been taking for granted, becausse Canadian government always organizing referendum for them in recognition of their legitimate right to demand for independence from Canada. Today, many countries of the world have been granted independence from already existing countries, why then should the aspiration of Biafrans be different? To make the matter most annoying, Biafrans did not at any point in history neither agreed to form a country with any people nor to name it Nigeria. Nigeria was a colonial decision that has spelled doom for millions of African lives. It was based on this that Biafrans approached the International Criminal Court (ICC), to step in on the matter. But the jokers, who call themselves African leaders, kicking against it by trying to blackmail the world with its threat to exit the court. Buhari must have bribed all of them with oil money; Nigeria is such a corrupt entity that it can hardly achieve anything meaningful without bribery. It is therefore a huge shame that those so-called African leaders who take the stance they were taking. We recognize that there are some decent people among African leaders. But one message to those promoting this evil agenda is that Buhari must be tried for his atrocities against Biafrans. You cannot threaten to exit from a body you willingly appended your signature to (without compulsion); but want to deny Biafrans exit from a contraption they had no part in its formation. African leaders or no African leaders, Buhari must pay for his sins.